I had never heard of dog agility until we got Gizmo, a bright little papillon puppy who loved learning tricks. One day, just for fun, my husband held up a plastic hoop. Gizmo sat on one side, and I sat on the other holding a treat. When Gizmo bounded through the hoop to get the treat, a canine hoop fanatic was born. He loved the hoop. He could not get enough of the hoop. The mere sight of the hoop would send him into a tail wagging frenzy, and he spend hours jumping through the hoop as we gradually raised it higher and higher. Then we saw a dog agility competition on television. There were all kinds of dogs not only jumping through hoops, but having fun doing all kinds of tricks. There were dogs running through tunnels, dogs flying over jumps, dogs weaving through a line of poles, and even dogs going over teeter totters. It looked just perfect for our little guy. So Gizmo enrolled in agility classes. He learned to navigate a course consisting of various obstacles such as jumps, tunnels, and high walks. He learned skills such as how to zigzag through weave poles, climb over A-frames, leap through tires, and sit on command on a table. But it was not just Gizmo who learned some cool skills. Agility dogs are guided by their owners, who run the course with them and direct them with verbal commands or hand signals. So we learned a great deal about dog training. We also kept fit running around the course, and got to know a lot of other friendly dog owners. Dog agility does not have a very long history. It is, in fact, quite a new sport which began in the U.K. in the late seventies. The sport originated at the annual Crufts show, a famous event which is known as the largest dog show in the world. The organizing committee of the 1977 show needed to entertain the crowds during a gap in the program, so they asked dog trainer Peter Meanwell to come up with an idea. Peter created an event similar to horse jumping but specially designed for dogs. He recruited some friends to help him build the equipment, and then brought together two teams to compete against both each other and the clock. The event was an instant crowd pleaser. It was such a success that it was repeated again the following year. The Kennel Club recognized agility as an official sport in 1980, and it became a team event at Crufts in 1981. Agility rapidly spread from the U.K. to other countries around the world, and the U.S. Dog Agility Association was formed in 1986. Which Breeds are Best at Agility? Agility training makes the most of a dog's natural ability by focusing on instinctive behaviors such as running, jumping. climbing and tunneling. In some breeds these abilities have been enhanced, so working breeds such as terriers, shepherds and retrievers generally develop into natural agility stars. While working breeds are generally the most successful, other types of dogs may face particular challenges. Flat-nosed dogs such as pugs and bulldogs, for example, might experience breathing difficulties, while short-legged breeds such as dachshunds may find it difficult to clear the jumps. However, the most important factors in success are not breeding or build, but the dog's energy level and personality, and the desire to succeed. I actually knew a dachshund who was great at negotiating all the agility equipment, including the jumps, in spite of his short little legs. 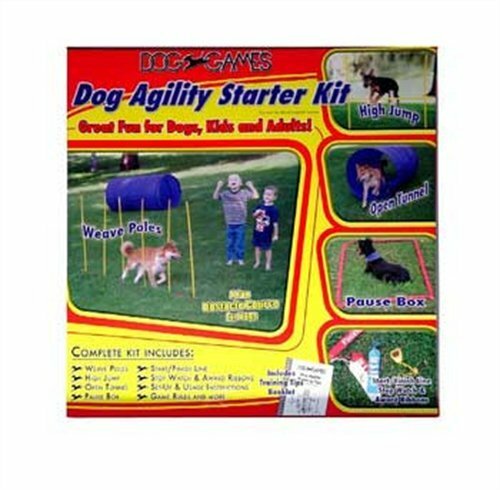 All breeds and mixes of breeds can take part in agility and no breeds are barred from competition. To make the competition fair for all entrants, there are special classes for different categories. There are generally separate categories for beginners and advanced competitors, and there may also be a separate category for senior dogs. Jump height are adjusted to accommodate the dog's size, which is calculated by measuring shoulder height. Gizmo measured a mere 12 inches at the shoulder, so he ran in the small dog class and only had to clear 6 inch jumps. The most obvious benefit of agility training is that it is good exercise for both dog and owner. Running around the course is an excellent aerobic activity which will improve heart function, reduce excess body fat, and improve overall health. It will also help to increase human and canine coordination, strength and stamina. Another great benefit is mental stimulation. Each agility course that an owner encounters in competition is individually designed to incorporate a variety of challenges. Owners therefore need to analyze each course and decide how best to run it with their dogs in order to achieve a competitive time. Being highly intelligent, dogs also benefit from the mental stimulation of running different agility courses and meeting the challenges they present. Agility also serves to strengthen the bonds between dogs and their humans. It may take between six and nine months to prepare a dog for competition, and training needs to be carried out regularly and consistently. During training, owners learn effective training techniques and dogs learn new obedience skills. Communication between the two is developed and enhanced as dog and owner develop an effective partnership. There are also psychological benefits for the dogs. Agility dogs are socially well-adjusted and have learned to socialize with other dogs and their humans. They are alert and confident, and they and their owners know how to have fun together. Because they are well trained and because the intensive exercise of running an agility course provides a positive outlet for excess energy, an agility dog is also a well-behaved dog. Before beginning agility puppies should have basic obedience training and be able to respond to simple commands such as "sit", "heel", "down" and "come". They also need to wait until their bones and muscles are sufficiently developed. The vetinfo website recommends nine months as the minimum age to begin training, but it is probably better to wait until your puppy is at least a year old. You should also be constantly aware of your dog's mental and physical well-being and never force him to do anything. If a dog refuses the challenge of a new obstacle he is probably afraid, so introduce new equipment gradually, using lots of positive reinforcement such as treats, praise or a favorite toy. On the other hand, if he refuses an obstacle that he is already familiar with, this could be a sign that he has a physical injury that needs to be checked out. We had lots of fun with Gizmo. He was a real show stealer. He loved the attention of the audience and his fans, and won hundreds of ribbons. Sadly he is no longer with us and we now have a rather aloof black cat instead. I have seen videos of cats doing agility, but I do not think our cat has either the talent or the desire to be a star. Oh I'm really glad you emphasized the types of doggies that enjoy these sorts of things. A friend of mine had a Border Collie and she said, "You could keep on throwing a stick all day long and a Border Collie will love to fetch it every time." I love to see dogs that are happy being active. Thumbs up, pinning, etc. Border collies generally make the best agility dogs. They have boundless energy (as you friend found out! ), are extremely intelligent, and they have been bred to respond to hand signals from a shepherd who might be at the other side of the field. This makes them naturals for the "away work" needed to become an advanced agility dog. Great piece. This part gave me such a fun visual "He could not get enough of the hoop. The mere sight of the hoop would send him into a tail wagging frenzy." We went to a local show 2 years ago at a 4H fair ago and it was amazing to watch. It was only the second time I'd seen any competition. One of my family members has a border collie - I could see why this breed would do well in agility :). Thanks, Leigh. Glad you enjoyed the article. This is a great way for you and your dog to get to enjoy each others company and it also helps to reduce destructive behavior from boredom. Our son had a dog named gismo too. We taught our Blue Heeler to do so many tricks around the home like bringing in shopping, getting the mail carrying anything from one room to another and laying several biscuits and only allowing him to eat one at the time. The trouble is that he is thirteen now and when feeling good he thinks he can still jump with a crook leg and gets upset when his leg hurts. So in hindsite moderation with jumping may prevent leg injuries. Once we threw his ball and he went like the wind chasing it and wrapped himself right around our hills hoist. He just shook himself and raced away again. But these things take their toll in old age. Rated up. Yes, it's sad to see age take its toll on your dog, isn't it? Gizmo was almost blind before we lost him but he still managed to chase balls by hearing and smell and remained playful to the end.